Who would´ve ever thought that, as a life-long Merc fan, I´d be cheering for Schumi some day?? It´s a strange world outthere!!! KingBenzai a écrit: Who would´ve ever thought that, as a life-long Merc fan, I´d be cheering for Schumi some day?? Hahahahaha. Welcome to the club Kingbenzai . They (Merc) are in the hunt with McLaren and Ferrari, perhaps a shade slower after the first test. They went to Valencia with a not particularly fully developed car and I reckon that they will have a major planned update at the second Jerez test or the Barcelona test. It also allowed Schumacher to play himself back in. And it seems, James Allen is saying McLaren is faster than Ferrari (fuel corrected, etc etc). I wouldn't worry too much about James Allen's predictions. Afterall, he predicted Ferrari would be the team to beat last year. Valencia is not exactly the track to be representative of the relative performance of the cars, although i do expect Ferrari to do well. Besides, with the huge fuel tanks this year, its not really possible to predict the fuel loads. Also, we have to remember that Kimi topped one of the tests last year and look where Ferrari ended when the season started . Dont press the panic button yet eh? ..... until someone wins EIGHT WDC !!!! KingBenzai was like the biggest critic of Schumacher and Ferrari. I like it that he is cheering for Schumi now as a Mercedes supporter . Schumacat a écrit: KingBenzai was like the biggest critic of Schumacher and Ferrari. I like it that he is cheering for Schumi now as a Mercedes supporter . However, let´s forget about all of that, we had many discussions about that in the past. Let´s concentrate on the future. Because here I am, with the Schumi-boys, actually cheering for Schumi. Though I will also cheer for Rosberg just as much. Well, nice to be in your corners for atleast 3 years, Schumacat and AsianBoy (that was your previous name, right Red Devil?). Good to have you on our side KingBenzai. Just remember Asianboy is not our friend. He is a Ferrari fan . Me? I stopped being a Ferrari fan when they signed You-Know-Who . Schumacat a écrit: Good to have you on our side KingBenzai. Just remember Asianboy is not our friend. He is a Ferrari fan . Hahaha. Ok, thought RDF was Schumi fan. Seems he´s a mole then in our Merc fan thread. Keep a close eye on him!!! lets just say i am half schumi fan but Ferrari comes first. see what schumi has done to us? It was easy for me coz I was no longer a Ferrari fan by the time Schumi signed with Mercedes, having left their ship as soon as they announced Teflonso as their driver . or what ferrari has done to us?? I accidently post that comment about the nose in mclaren thread..
Hi Guys - not long now! WELL DONE Mercedes GP Team !!! 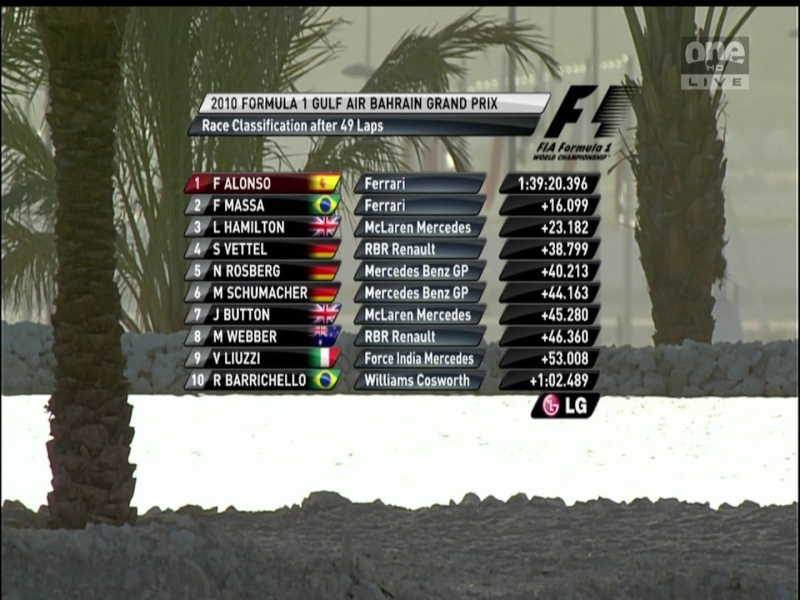 End of Practice 2 at Bahrain with NICO topping the times at 0.445 ahead of Lewis and 0.494 ahead of Schumi ..... WOW !!! I think we are in business Ladies & Gentlemen !! Nico is making us remember he is in the team too!!! .... Go get th'm in Melbourne !! Yeah - I guess McLaren have been at it just a little longer (since 1963) while this year is Merc's first year as a full manufacturer since 1955 ..... allot of water under the bridge! well BMW didnt buy defending champion for their first race.